Stems: Erect, usually solitary, wand-like, pubescent with hairs ascending or curved toward stem. Leaves: Alternate, odd pinnately-compound; leaflets of primary leaves 5-13, lanceolate to elliptic or narrowly egg-shaped, 4/5 to 4 inches long, glabrous or sparsely hairy above, velvety-hairy beneath, strongly veined; margins coarsely toothed; smaller leaflets between larger leaflets; stipules conspicuous, lanceolate to nearly ovate, wing-like. Inflorescences: Racemes, spike-like, very slender, terminal; stalks erect at flowering, later bent downwards; axis of inflorescence densely short-hairy. 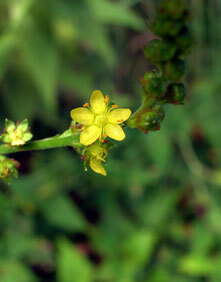 Flowers: Tiny, regular; hypanthium (enlarged receptacle below calyx) top-shaped to hemispheric, fluted, bristly hairy; sepals 5, green, spreading at flowering, later incurved; petals 5, yellow, 1/8 to 1/6 inch long; stamens 5-15. Fruits: Achenes, 1-2, spherical, about 1/10 inch in diameter, enclosed in persistent, hardened hypanthium. Habitat: Dry, open or rocky woods and thickets. Comments: Latin pubescens "downy or hairy", in reference to the pubescence on the stem and leaves. Ancient and medieval writers describe European Agrimonia species as being used medicinally to treat dysentery, liver and spleen disorders, snake bites, rabies, and parasites.